On 7 September 2018, the Ministry of Construction of the Union Government of Myanmar (“MOC”) officially opened the Request for Qualifications (“RFQ”) phase of the USD 400 Million Yangon Elevated Expressway Project (“the Project”). The Project is set to be one of the largest infrastructure projects ever undertaken in Myanmar and will take the form of a Public Private Partnership between the successful bidder and the MOC. The Project will consist of an approximately 47.5 km long elevated four-lane ring road. 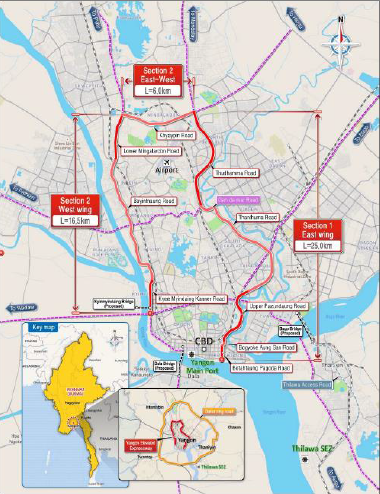 The elevated toll road is expected to connect Downtown Yangon, Yangon Port, Yangon International Airport, Mingalardon Industrial Park, and the Yangon-Mandalay Expressway. The Project is to be constructed on viaducts adjacent to and overhanging existing roadways in Yangon. All roads in Yangon, although operated by the Yangon City Development Committee (“YCDC”), may be legally owned by different government entities, for example the union or region-level authorities. Ascertaining the precise ownership of the particular government entities will inform the resulting usage rights which are conveyed to the Project Company. We believe that the responsibility for securing land usage rights will fall on the relevant government entity, such as the MOC. This undertaking would likely be included in the project documentation, namely the concession agreement. Securing appropriate project documentation will significantly reduce the burden on the Project Company, as the MOC will be obligated to deliver both the Project Site and any accompanying land usage rights necessary to commence construction. As with other toll road projects that we have seen, it is expected that the Project would generate a steady stream of revenue from levying toll fees. However, given various greenfield toll road risks, such as traffic risk or even the lack of a willingness to pay by road users, which may be fairly associated with a greenfield toll road project of this size, we recommend that any sponsor initially seek government support. Such support would be in form of government financial support for the MOC’s obligations which will potentially form part of the concession agreement, such as guaranteeing project revenue or an availability payment, as may be seen in other infrastructure projects. Two prevailing options for the sponsor to gain a Government Guarantee and Undertaking (“GGU”) include either a GGU issued under the Public Debt Management Law of 2016 (“PDML”) or a contractual GGU as we have seen recently, following the Myingyan “BOT” standard. Under the PDML, the Ministry of Planning and Finance (“MOPF”) may issue a sovereign guarantee, subject to the approval of the national assembly. While many sponsors have been eagerly awaiting this MOPF-issued GGU, the final form of policy which would permit the issuing of these has not been publicly disclosed. We expect that this project and similar projects may be able to negotiate an undertaking to procure such a GGU once this policy is firmly established. The second option is to procure a ministerial guarantee and associated undertakings in the concession agreement. This structure has been successfully implemented in the internationally tendered Myingyan power project, which is expected to begin full commercial operation very soon. Based on the financial success of the Myingyan project, it is advisable that any sponsor consider not only the award of the financial benefits of the toll road, but also the inclusion of necessary government undertakings and assistance in the project documentation.